Fairy lights twinkle against closed curtains and orbs sparkle on festooned trees. Snuggled under the crochet blanket, I warm my hands against a cup of mulled wine. 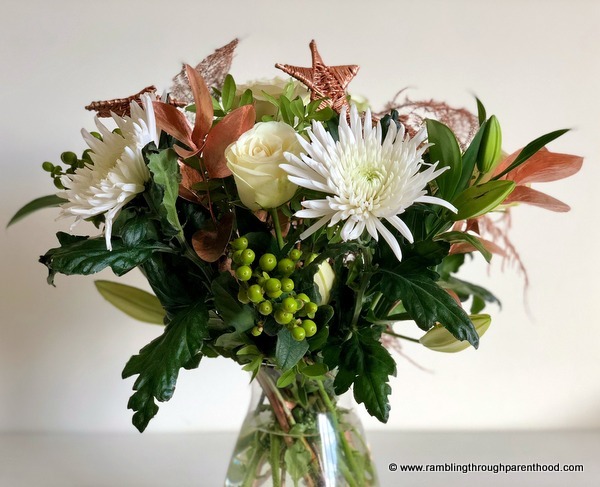 I am basking in the glow of nearly-Christmas, breathing in festive cheer, as the merry bunch of flowers in my window look on with a knowing smile. This is what happens when I mix Christmas and a bouquet of beautiful flowers. A heady mix to spark creativity! 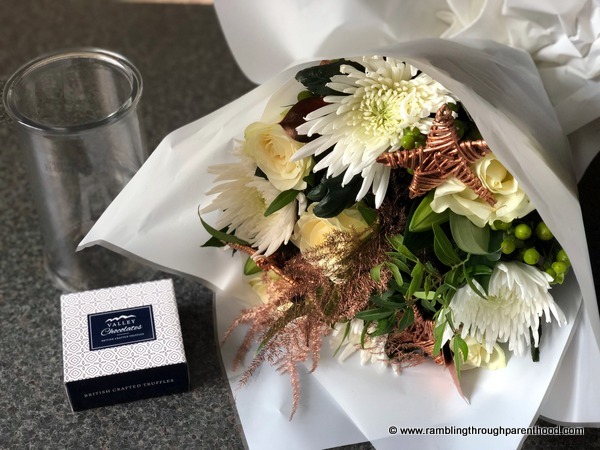 On a more sombre note, thanks to Prestige Flowers for sending me this stunning Winter Warmer bouquet. 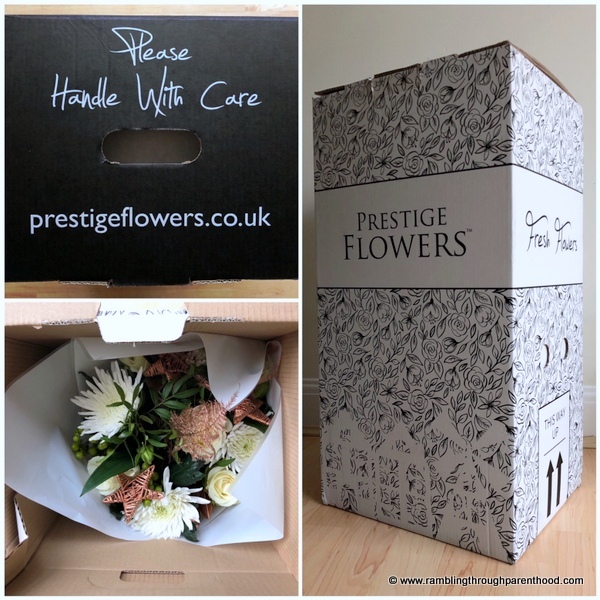 The flowers arrived neatly and carefully packed in a large cardboard box. The box carried ample warnings about the contents being fragile and in need of careful handling. The box itself was charming with a monochrome floral pattern working through it. I opened the box and found a gorgeous bunch of blooms and foliage staring up at me through the packaging. I eased out the bouquet and found a box of chocolates, a small glass vase and care instructions underneath. Also included was a little note hoping I enjoyed the flowers. It’s small gestures like this that add value to the experience. The flowers were beautifully arranged and were held in place with a band. 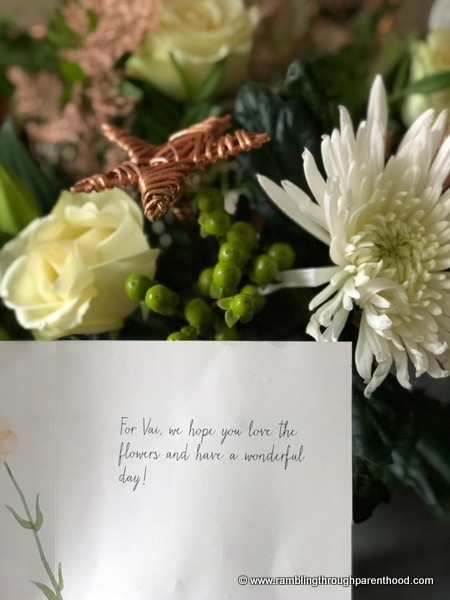 The stems were wrapped in a moisture-retaining material, which meant the flowers would remain fresh even if there was a slight delay placing them in a vase. I removed the packaging, cut small diagonal pieces off the lower ends of the stems and cleared some of the leaves. I tried to, but couldn’t snap off the bronze-painted stems. Not sure I was meant to? Next, I emptied the enclosed flower food into a vase, topped off with water and placed the bouquet in it. I then stepped back to admire these beautiful blooms. There were white roses and chrysanthemums offset by green berries and lily buds. 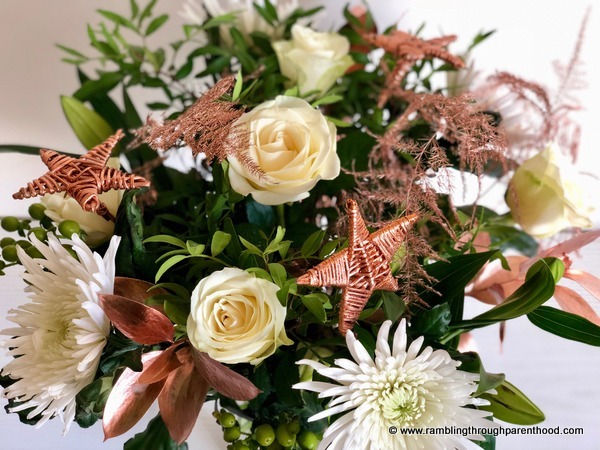 Bronzed stars, fern and leaves added contrast. 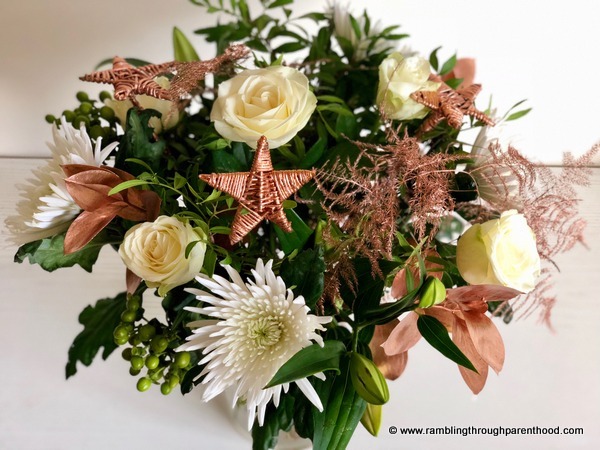 I loved how instead of the more traditional green, red and gold of Christmas, this bouquet incorporated green, white, bronze and still exuded festive charm. It’s been almost a week, and the bouquet is going strong. The lilies are starting to bloom. The roses are looking slightly droopy, but the rest of the flowers and foliage have kept their fresh feel. By chopping and changing a bit, I should have these flowers with me through next week, if not longer. 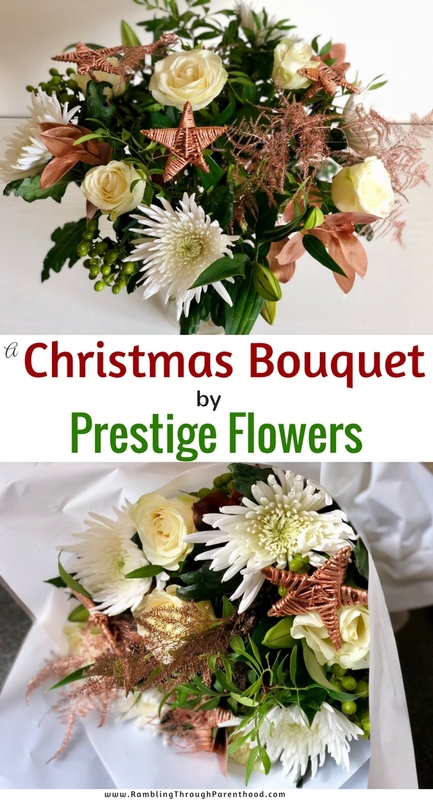 If you are looking for extra festive cheer or an added dose of creative sparkle, why not buy a bouquet of flowers from the Prestige Flowers online shop. Better still, send a bunch to a loved one as a treat. Disclosure: I was sent a Christmas bouquet for the purpose of this review. All opinions are my own.